A few weeks ago, I surveyed the Los Angeles Filipino food scene and some of the chefs and cooks attempting to establish the archipelago’s cuisine in the city. The latest Filipino concept to arise since my piece published is called Rice Bar and will unveil today as it soft opens in Downtown on Monday, furthering this Pinoy food trend. Santos Uy (owner of Papilles and Mignon) and Charles Olalia (Patina and Terranea Resort’s mar’sel) is the duo behind Rice Bar. The restaurant is a “chef-driven, fast casual concept that features fair trade, heirloom rice.” But underneath these industry buzz words is a Filipino foundation of flavors and memories. 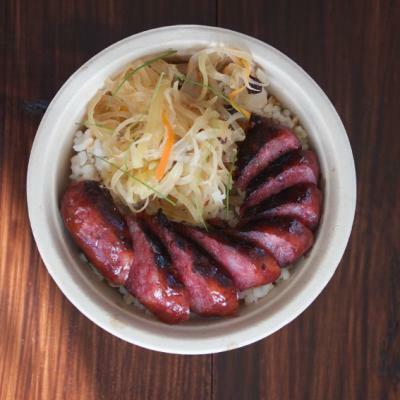 But the other truth is Rice Bar has plans for bringing refined touches to classics, like its house made (from a family recipe) longganisa, a Filipino-style chorizo. 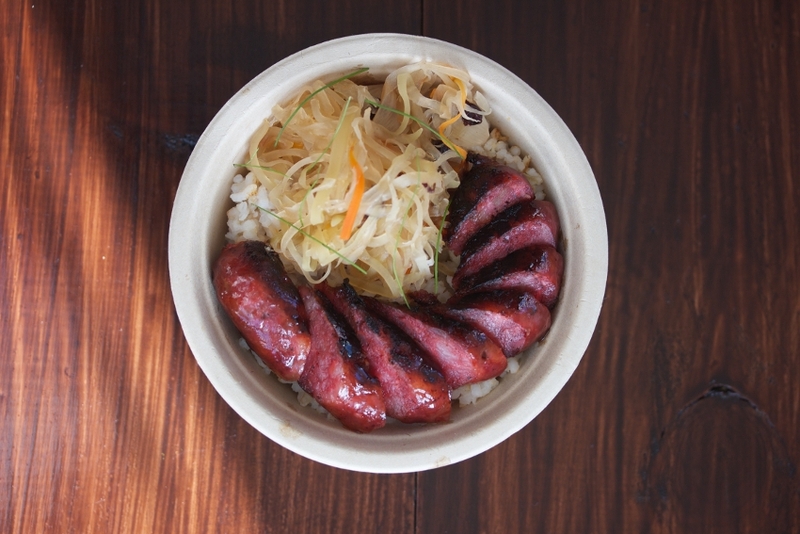 The thick red sausage slices with pickled papaya and a fried egg rest on a bed of heirloom rice sourced from Eighth Wonder Heirloom Rice and Social Products—these suppliers seek out and support small family farmers in the Cordillera region of the Philippines. In fact, Rice Bar’s selection of heirloom rice of various grains aims to be a hallmark of the tiny 7 seat eatery with 4 extra spaces along a ledge. For those diners who are unfamiliar with Filipino fare and its range of flavors that ebb and flow between savory, sour, spicy, and pungent, utilizing an array of spices and fermented ingredients, Rice Bar is hoping their fans will spread the word through the power of epicurean evangelism. But then again, for the uninitiated there’ll be items like Filipino roll sliders filled with SPAM and griddled eggs to ease into the cuisine. 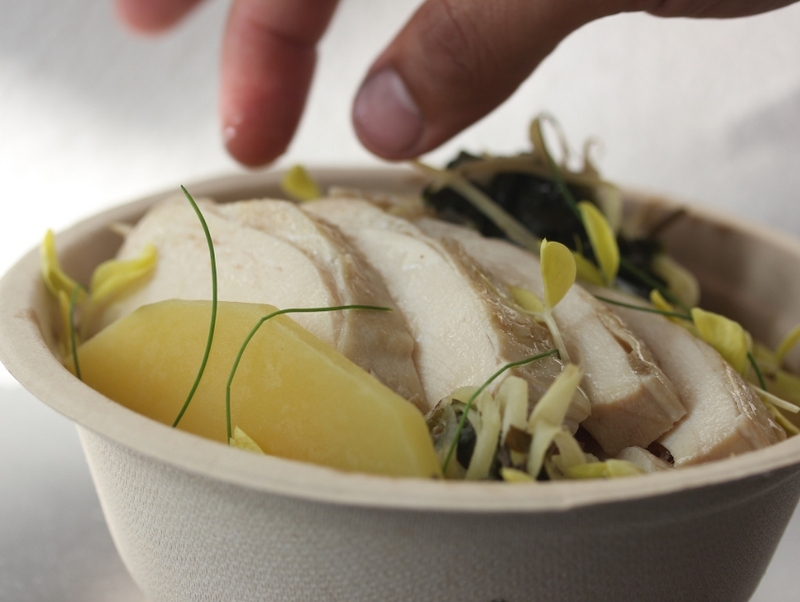 Some other special items at Rice Bar include Chicken Tinola, a soupless variation of the Filipino classic that applies slow-simmered Jidori chicken brimming with young papaya and chili leaves with ginger spice into a rice bowl. Pancit Luglog is a thick rice noodle cooked in shrimp stock and smothered with a smoked fish, crushed pork rinds, and squid cakes. Similar to a Chinese tamale called zongzi, Rice Bar makes Mushroom Suman, sticky rice sealed in lotus leaf stuffed with mushroom ragú punched up with Asian chilis. Rice Bar soft opens today with a limited menu and will open everyday for lunch from 11 a.m. to 5 p.m. for dine-in and carry-out.